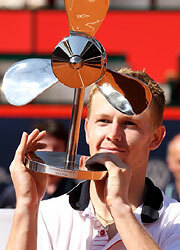 Golubev wins his first ATP title in Hamburg. Andrey Golubev capped a dream week on Sunday by becoming the first player from Kazakhstan to win an ATP World Tour title with a 6-3, 7-5 victory over third seed Jurgen Melzer in the final of the German Open Tennis Championships in Hamburg. As champion of the ATP World Tour 500 clay-court tournament, Golubev received 500 South African Airways 2010 ATP Ranking points and €228,000, while runner-up Melzer earned 300 points and €104,000 in prize money. The 23-year-old Golubev, who celebrated his birthday on Thursday by recording his first Top 10 win over No. 6 Nikolay Davydenko in the third round, is the third first-time winner on the ATP World Tour this season. He joins John Isner (Auckland) and Ernests Gulbis (Delray Beach). Golubev had won just eight tour-level matches this season coming into Hamburg but discovered his best form as he raced to the title without losing a set all week. He was contesting his second ATP World Tour final, having finished runner-up to Andy Murray in the 2008 St. Petersburg Open final.